From the bunny hill to Black Diamonds, you’ll find your level of expertise on this ski slope. Nestled in the majestic Rocky Mountains on the shore of Whitefish Lake, this small, friendly Montana town offers the best in four-season recreation. 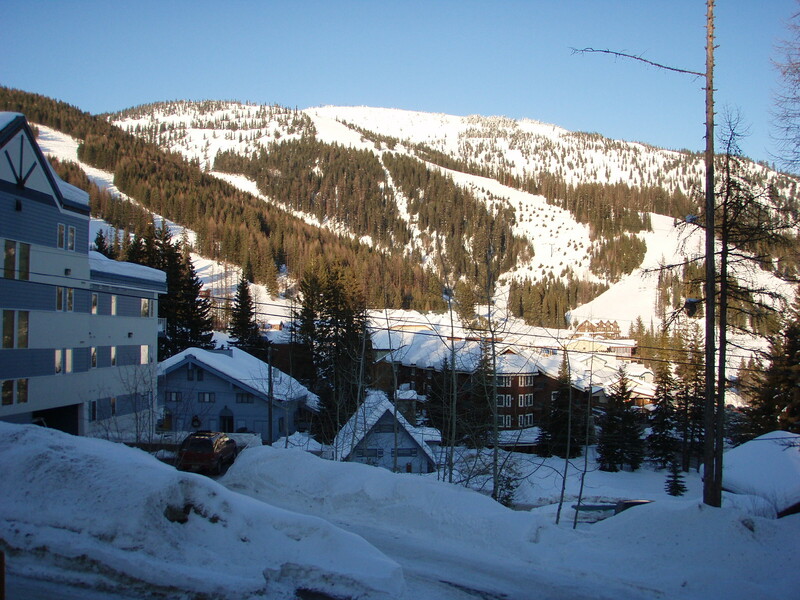 Whitefish is surrounded on three sides by picturesque mountain peaks that include the ski area Whitefish Mountain Resort just outside of town (and up the hill). Besides downhill skiing, there is the Glacier Nordic Center with machine groomed trails for skate and classic cross-country skiing. The area offers summer activities including the most scenic gondola ride in the northwest, zip line tours, downhill biking, hiking, horseback riding, chuck wagon dinners, shopping (and window shopping) plus an excellent array of dining in the village or up on the summit. Recently developed are the Whitefish Bike and Pedestrian Trail. The refurbished Great Northern Railroad Depot, the Whitefish Chamber of Commerce, along with the western-style covered walkways, are the focal point of the downtown area. 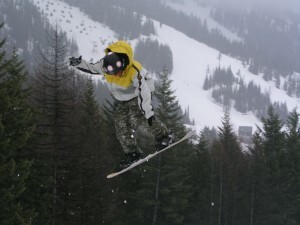 “Catching Air” at the local ski slopes! Whitefish Lake is seven miles long and is partially within the city limits. Whitefish Lake has several parks on its shoreline including City Beach offering a sandy swimming beach and beautifully landscaped public park. The sandy beach provides picnic tables and barbecues under roofed pavilions, as well as sunbathing, docks, and a public boat launch. Of course there is a wonderful golf course too at the Whitefish Lake Golf Club, offering spectacular views of the mountains and Whitefish Lake. A private course, Iron Horse, sits to the north of the village. Located between Whitefish and Columbia Falls is Meadow Lakes Golf Course. Evenings throughout the year can be filled with delightful theater via the Whitefish Theatre Company and Alpine Theatre Project. There are a plethora of fun dining experiences in Whitefish, so where do we start? How about with dessert! Young entrepreneurs opened Sweet Peaks where you can lick up your favorite flavors of gourmet ice cream like Salted Caramel or try something more unusual like Avocado-Lime (Diana has tried both of course!). Breakfast spots include the Buffalo Cafe which has been around for years and stands the test of time. (They are also open for dinner and they have superb burgers – Try the “Date Night” which is a burger with roasted dates & bacon!) For fine dining the list is kind of long but Scott’s experienced them all…. He’d recommend McGarry’s Roadhouse where he says “Its always so dang good!” He favors an appetizer called “Spiders” which is composed of crab and cream cheese (not to mention deep fried) – Yum. After a day of golf sit back at the Whitefish Lake Restaurant located at the Whitefish Golf Course in the neat old log building featuring some great steaks. While up on the ski slopes dine at Cafe Kandahar. Sushi, sushi, sushi = Wasabi’s Sushi Bar. Everyone gives a thumbs up to Ciao Mambo – an Italian restaurant that doesn’t short you on the garlic or bustling atmosphere. And for just sheer fine dining reserve a table at the Tupelo Grille right in the heart of downtown Whitefish – oh so delicious!